The Guardian report that I posted about yesterday had a segment on the question of abortion and mental health. This is an area where psychiatry has become highly politicised. On Mercator, Dr Pravin Thevathasan gives a brief summary of studies that reach widely differing conclusions (See: Shutting down the debate.) The study of Danish researcher, Trine Munk-Olsen concluded that there was no causal link between abortion and subsequent mental ill health. The studies of Professors Coleman and Ferguson found a large increase in risk of mental health problems. 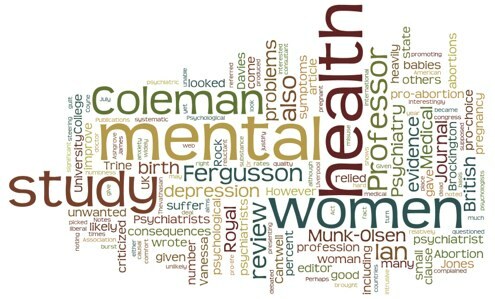 This July, there will be an international congress of the Royal College of Psychiatrists in Liverpool - only those who find no link between abortion and mental health problems have been invited, it seems. This in itself contradicts the validity of the legal ground that is nearly always given by doctors for approving an abortion - that it will improve the mental health of the mother.